Another page! We're on a roll! Sorry for the cliffhanger here!!! Thanks again forever and ever for all the amazing comments! You guys are great!!! 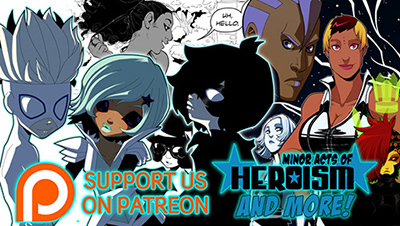 We seriously appreciate all the support and we'll keep working hard to turn out pages fast! i love all of your art! Hugs for simon! The fluffiness! And Simon manages to grab some cake lol. No, seriously, it's my best guess. And, come on, he's pale, probably some kind of immortal and he's one hell of a stylish super hero. This is not normal. He's got to be a vampire. I'd love to see this comic animated :P The kids are just too cute! Ahaha, I just re-read the whole comic. This is such a riot. Love it. I can't wait for the next pages but at the same time I'm thrilled to see the next STOP pages. I LOVE Simon and Simon!Daddy. XD They're so cute. ^.^ And what condition! Condition makes it sound deadly? Is he dying!? I don't think Sergio can take another person dying on him! <3 How cute! And the hugging! He's a clooooooooooone isn't he?!?!?! LoL at this point anything's possible. List of guesses: clone, actual son, descendant of some sort. I'm gonna state the "obvious" and guess that this is an ongoing tradition of passing down the "name?" Anyways, great artwork, style, and formatting; I admire how professional your pages look. Y-You, you just need to stop it. |: YOUR ART IS TOO DAMN GORGEOUS. /brb fangirling all over the damn place. "armf?" sweet jeezis, this is one of the cutest things i've ever seen. OMG YOUR CLIFF HANGERS!!!! FOR SOME REASON THEY ARE SOOO EPIC!!!! haha I love your comic so far!!! It's very fresh and unique :D Sorry, I just had to tell you. Um, yea, that is all :P Keep it up! Simon is adorable. I love this comic! Keep it up. OMG.... cliff hanger noooo! XD I am severly curious now. I saw this comic in an ad, and I was like," oh I'll read that later", and it was on my recommended list, and I was like "oh, I'll get to it someday..."
and I then finally read it, and I was really missing out, and I do not regret reading his at all, this comic is probably the best thing I have ever read online. BIG EYES OF ENDLESS CUTE! Simon with his hair down is just so... squeeeeeeee. I am rapidly falling in love with Sergio's eye. Look how small Simon looks. So adorable being held there all pouty. awww father son moment sooo kute!!!! Those towels look so fluffy *A* I want one!! the looking the gentleman's face is so...grawr! it makes me sad just looking at it! omg! simon looks super cute like that! and poor sergio! i freakin love this comic! one of the best ive ever read ever! Asdfghjkl Simon and his stepdad are SO CUTE.